I think many can relate to this quote. As I was reading Sylvia Plath’s novel this passage jumped out at me so much that I needed to share it with someone else. I feel like the best novels have these moments where the words just seem perfect. They tell the truth in words that you didn’t realize to put together until they were spelled out in front of you. And then the words don’t go away. One of my favorite novels got me hooked from the quotable lines starting early in the text. This novel was The Thirteenth Tale by Diane Setterfield. And I feel if I’m talking about great quotes then I have to mention two from her novel that have stayed with me for years. I love this quote! It reminds me of why people read. Lovers of fiction rejoice in the story-lie that sometimes tells the truth better than the truth can. That is why we read fiction. It is the comfort to our soul when there isn’t much comfort to be had. This is my second favorite quote of a very quotable book. I think you can tell a lot about a person by the way in which they tell you a story. It’s not just about the story, its details, but about the person who is telling it. In my mind, as I’m putting all these quotes together, there’s a picture I see of a writer sitting in a fig tree. This writer sees all the possibilities. All these little stories, or figs, are waiting just out of reach. Little mythical worlds are perch on top of an array of personalities. And indecision kills them all. My fig tree is full of stories or what Setterfield’s novel would call lies. Sometimes there’s only enough inspiration and motivation to pick one and if I’m distracted for a second then it’s gone. All the stories that never were are blacken and shrived. 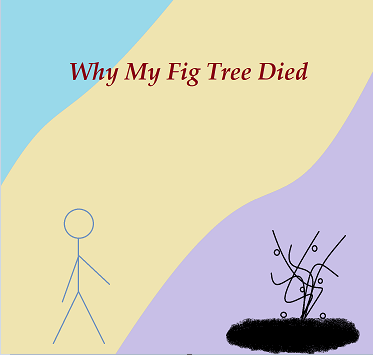 And then I take a brief moment and give reverence to those sad figs lying on the ground. Maybe a really great story just fell but the great thing about trees is that they grow. There will be more soothing lies to be told.